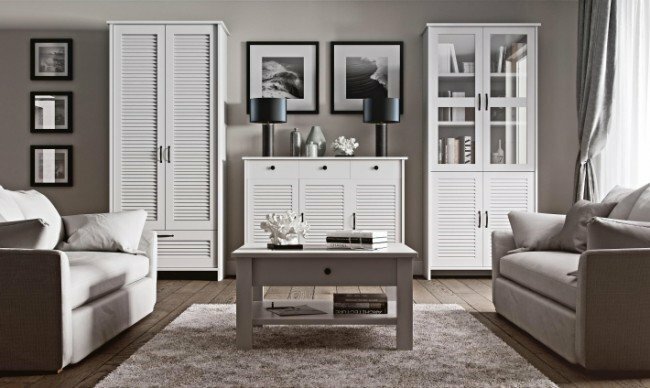 It is not problematic to buy sideboards and cupboards for the living room inexpensively, at a price that is beneficial to the consumer. Many manufacturers offer a variety of models for every taste. This kind of furniture was very relevant several decades ago- they were an attribute of any apartment. But now they are still popular- the designers simply began to produce these products in a modern style. A sideboard is a cupboard in which you can store utensils and various table accessories. As a rule, it consists of two parts - the top and bottom. Even if the sideboards for the living room are inexpensive, they still need to be externally attractive, and most importantly - ideally complement the interior of the room. 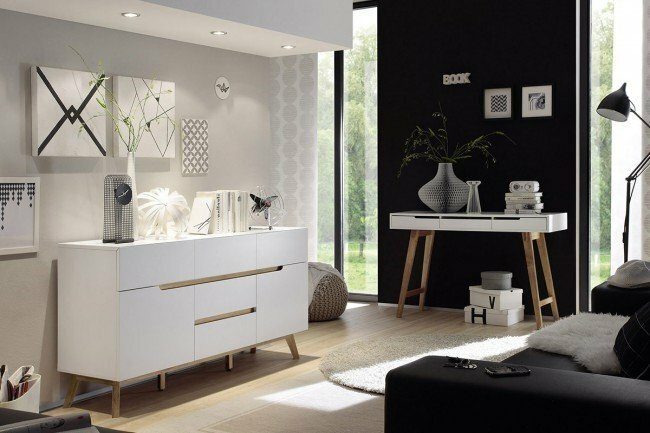 Modern sideboards look can look beautiful and stylish. Due to the presence of different shelves, they perfectly cope with their main function - storage of things, especially tableware. Some designs have transparent doors, but there are also completely enclosed cabinets. Quite often, the leaflets are decorated with patterns, use additional fittings. Recently, designers have increasingly complemented this furniture with lighting. It looks very nice when all the decor items in the sideboard are lit. 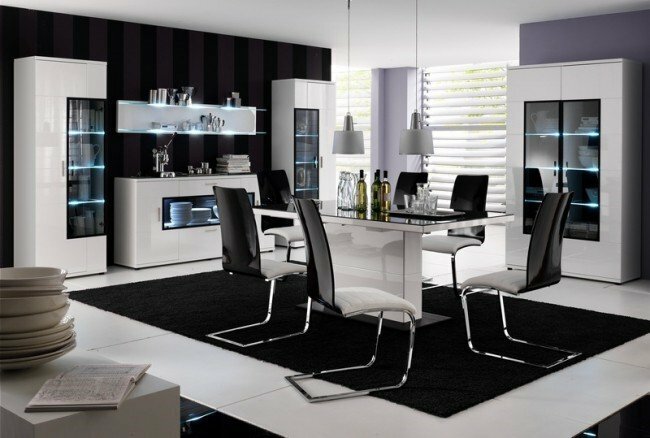 When buying a sideboard for the dining room, you should pay attention to the material the piece of furniture is made of. If the finances allow, it is best to choose natural wood products, e.g. : cedar, oak, pine. Such furniture is more durable, of course, provided it is properly taken care of. The quality of the sideboard made of chipboard is much lower, but in this case, it will also be reflected in lower, more affordable price. This purchase is a good option for those who want to buy inexpensive sideboards for the living room. It is very important to pay attention to this point: is the sideboard fold-down? After all, not all models are sold in disassembled form. Collapsible sideboards are easily delivered home, and later collected by craftsmen during the assembly of the furniture. Unassembled models are much more difficult to transport, but they are more durable and stable. 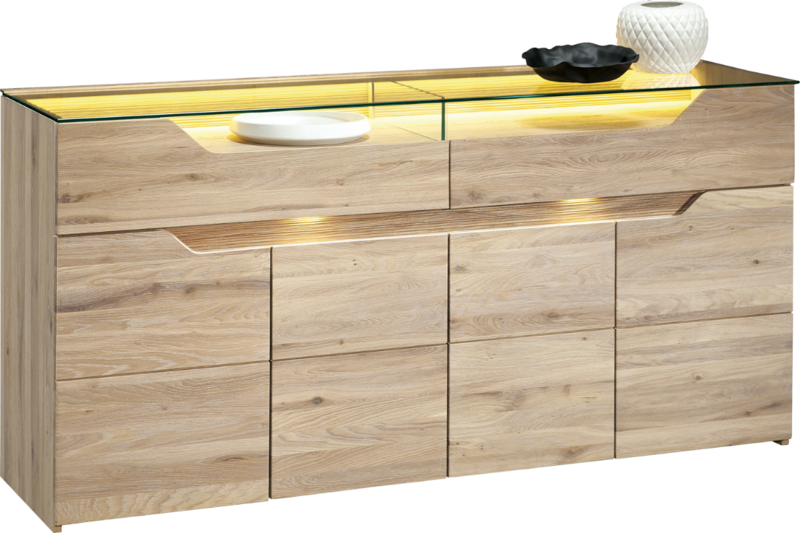 Sideboards can be standard, modular, island, wall, or corner. Slides might be a better option for small living rooms. 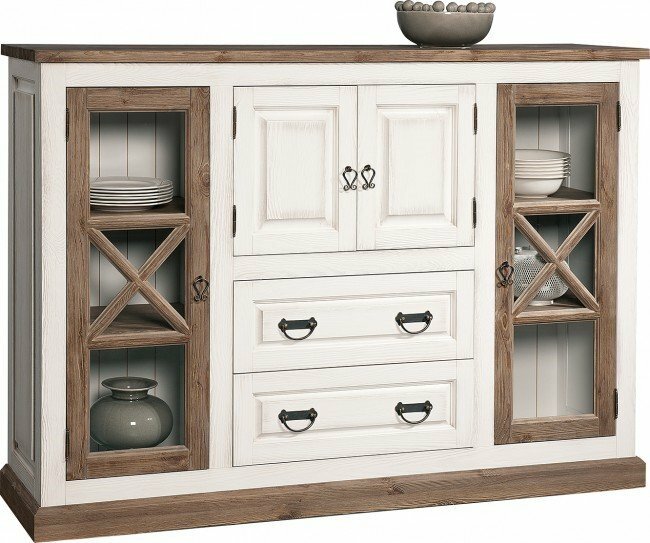 This kind of sideboard is smaller, has few shelves, but includes a niche for the TV. Classic cupboards are not bought for the purpose of showing guests a variety of decor, its direct duty is to store utensils. 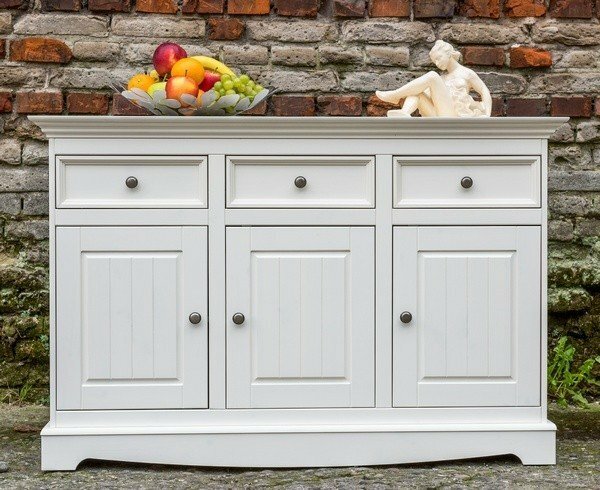 This stunning sideboard is an updated version of the old furniture that look quite ordinary. Designers managed to breathe a second life into it thanks to a unique method of applying special coatings on a wooden base that filled the sideboard with vintage chic. The furniture is decorated with two-dimensional wooden elements, which are located on each door. This sideboard has two drawers below and two little doors. This gives an “aristocratic” touch to the sideboard, and also remotely resemblesstucco molding. The retro form got an entirely new life, surrounded by new-fangled things. 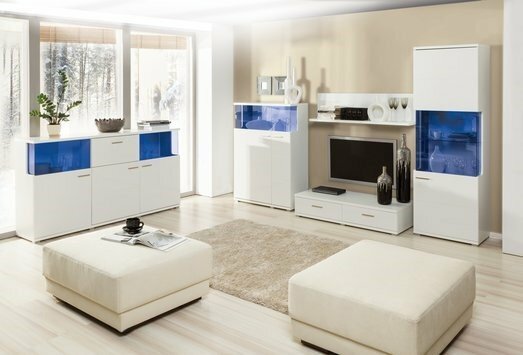 A modern white sideboard is an ideal piece for creating a bright living room. It has small inserts of typical wooden color, which only shade the milky façade. 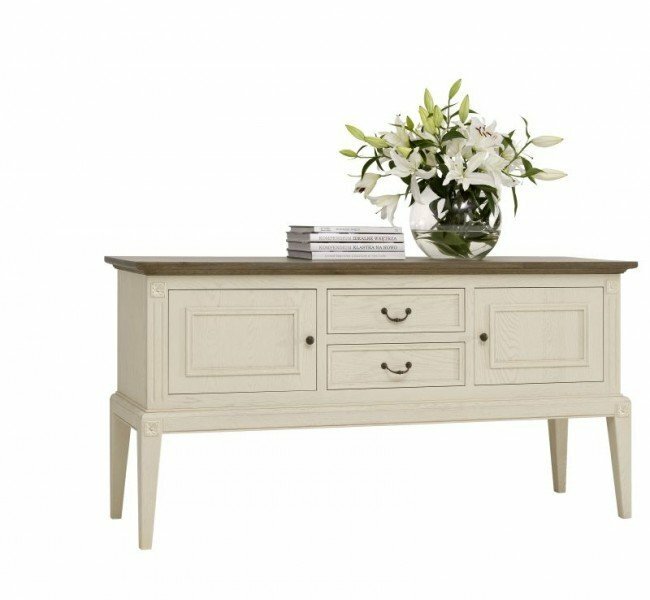 The various components of such a sideboard will help to conveniently arrange a variety of items. 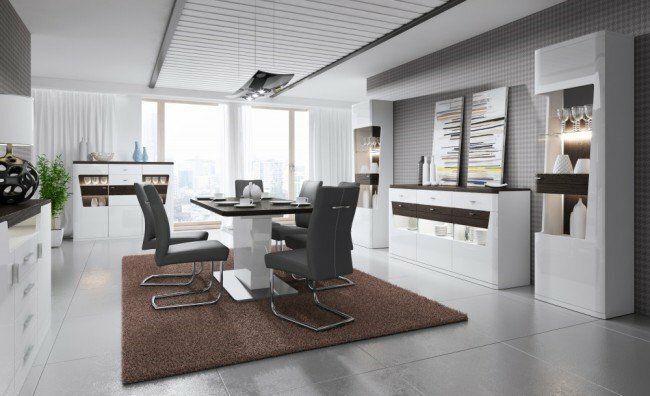 This combination of furniture allows you to achieve harmony and saturation of the interior without the risk of cluttering up space. Especially well servants of this kind are looked in the interiors of the Mediterranean and Provencal style. 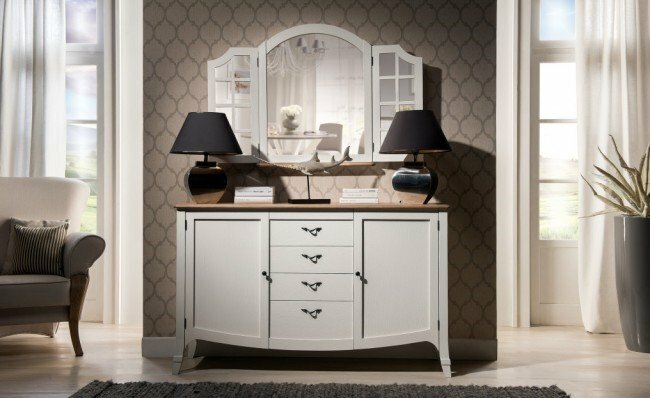 This sideboard is presented in classic white color and is equipped with two doors aside and four drawers in the middle of the sideboard. Black handles give this piece of furniture unique look and make it stylish. The original sideboard with rounded lines and minimal filling is the choice of young and practical people. Such furniture, with all its seeming simplicity, thought out to the smallest detail. Soft backlight adds an extra charm, and also looks very impressive in the evening with a slightly muted or completely off main lighting. The geometry of the furniture is pleasant for the eye, especially for those people who appreciate the exquisite shape. 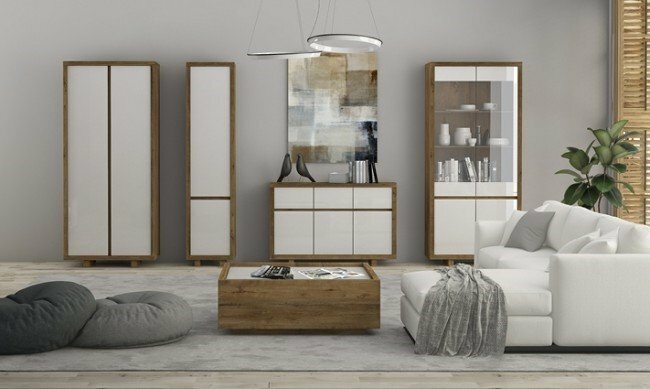 This cabinet is suitable for interiors of minimal and modern styles. The first thing to think about when choosing sideboards and cupboards for the living room is what purpose it will serve. After all, you should not limit yourself to only store table accessories in it. A sideboard can be designed for anything. It can be used to keep books, cosmetics, accessories, household appliances, decorative elements, etc. What is exposed for show, for example, figurines, candles, expensive utensils, is located on open shelves or under transparent glass. The rest is stored behind the closed doors. Therefore, if the main purpose of the sideboard is to demonstrate all those beautiful objects, then it is better to give preference to models consisting of shop windows. 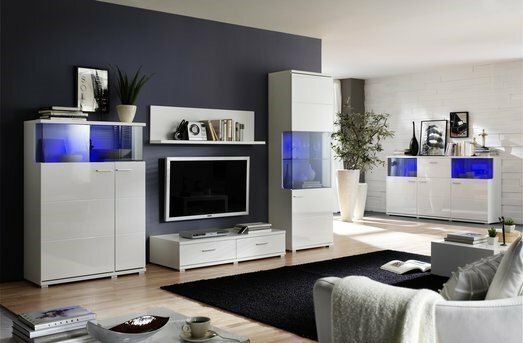 For a better effect, it is desirable to choose furniture with lighting. Those will be able to emphasize all the splendor of the decor. By the way, the backlight can be not only yellow or white. In modern models, you can choose another color for lighting. 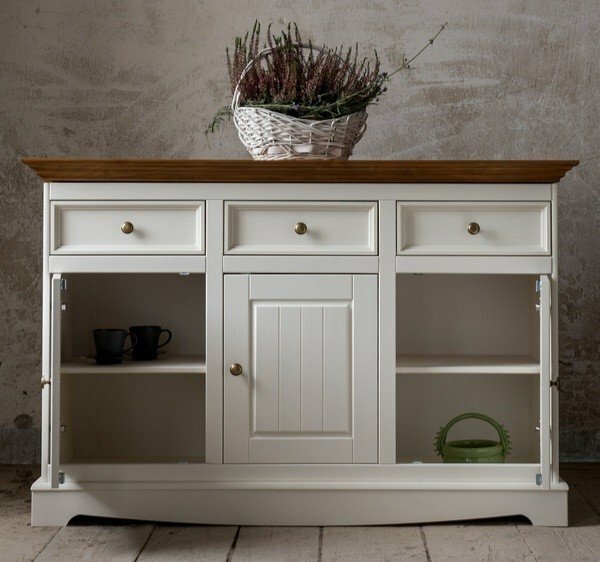 If the sideboard is bought for practical reasons, that is to store a lot of different things, you may want to choose a roomy cabinet. It should be equipped with closed doors. The quality of the fittings is important here, as it may be necessary to open and close the doors quite often.